Photos, Videos, Posters, and More! I am saddened to find out that the government’s intention to build an 8-lane highway cutting through Bukit Brown. This would destroy the scenic beauty, natural environment, habitat for endangered wildlife of Bukit Brown. 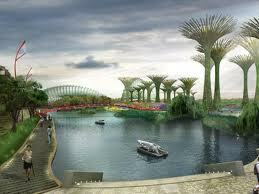 The recent spending of the 76 million dollars re-development of Bishan-Ang Mo Kio Park and the 1 billion dollars for Garden by the Bay showed the government’s serious commitment to a ‘green’ Singapore. However, the efforts to protect the natural green forest and biodiversity of Bukit Brown do not reflect the same kind of ‘green’ Singapore aspirations. I would like to highlight that Bukit Brown is currently used for recreation (jogging, walking dogs, cycling), unique tours led by civil society, environmental protection, appreciation and more. Bukit Brown is a park and a common space for people from all walks of life. In that way, Bukit Brown is an organic ground-up development and in that way, it is priceless and irreplaceable. Hence, I wonder why do we spend billions of dollars for a man-made landscaped park where we shipped trees from all parts of the world adding to the carbon footprint of the world and readily trade-off the free, natural and meaningful Bukit Brown for the short-term gains like the 8-lane highway. Saving Bukit Brown is more environmental friendly and sustainable in the long term. As Minister of National Development (MND) Khaw Boon Wan have pointed out in his statement, “Singaporeans have to take ownership of public spaces”. Therefore, I ask the government and Singaporeans to come together to be committed and creative in planning our future. Natural resources like Bukit Brown forest and biodiversity is scarce. Collectively, we can find a solution to save Bukit Brown and have a really ‘green and sustainable’ Singapore. Bukit Brown is a site where many of the fallen from World War II lie. It is a burial for war heroes, just like it is a resting place for members of the Tongmenghui (同盟會). These add significance to a green space that is also an environment where Singaporeans can connect with what our forefathers represent. Projections do not capture these. “Stop at Two” and the “Graduate Mothers Scheme” also relied on projections. These were well-meaning, but later needed significant corrections. Singaporeans bear the cost of such adjustments. 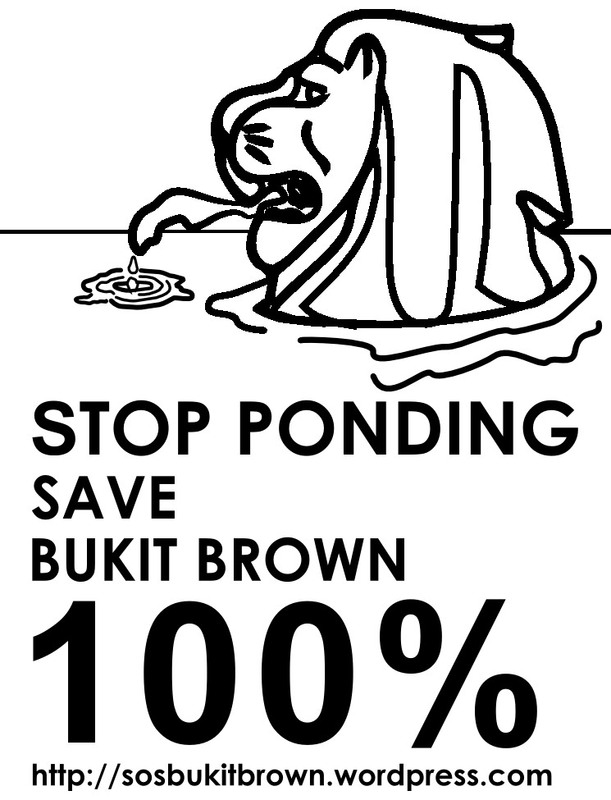 Save Bukit Brown. Save OUR Singapore. Petition at sosbukitbrown.wordpress.com and write your MP. Thank this Bukit Brownie for making this video! If you enjoyed watching the latest video contribution from this concerned citizen. Inspired by it, do like it and even better make a response to it. If you want to join the campaign send the images, messages, articles and videos coming! Watch the latest video contribution from another concerned citizen. 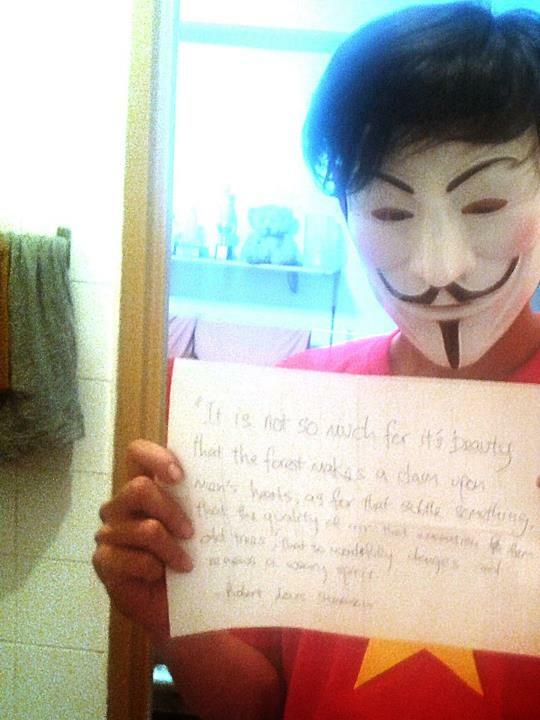 Keep the images, messages, articles and videos coming! 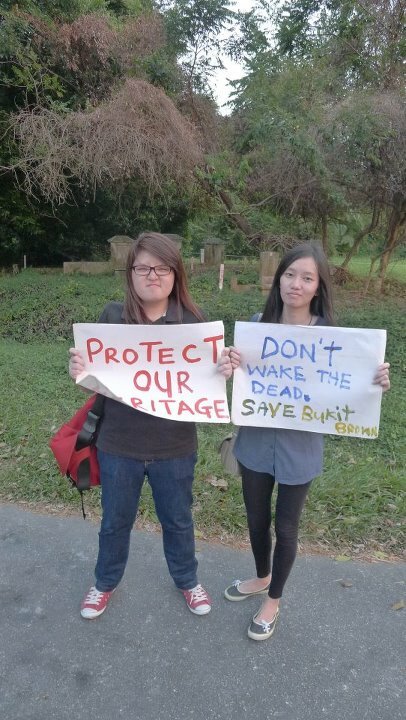 Some people ask where we get the motivation to keep pushing for Bukit Brown’s protection. Let’s just say we get it from the very top. We are in agreement with what is being said recently! So don’t wait liao. Stand up and be counted. Sign the open letter to support the protection of Bukit Brown at sosbukitbrown.wordpress.com or go to our Facebook page. These places got more information on Bukit Brown also. Voices of dissent to recent development plans have been increasing in volume. This is partly due to the fact that social media has provided an effective platform for mobilising public sentiment and partly due to growing demand among Singaporeans for open engagement and participation in policy-making. Examples are the campaigns to save the Bukit Brown Cemetery, the Rail Corridor, the Old School at Mount Sophia and numerous other instances involving national issues of land scarcity and urban transport. There is no need to further espouse the historical value of the cemetery to the nation’s culture and identity and its importance for collective memories. These issues have been highlighted by the Heritage Society and Nature Society, as well as in myriad letters from the public. One only wonders whether this is enough to rouse the nation from its familiar apathy towards the government’s pro-developmental strategies that often throw the nation’s heritage under the bus. The eventual development of the cemetery land may have been publicised in the 1991 Concept Plan but one should recognise that concept plans only serve as a guide. If present conditions make some developments unsuitable, it makes no sense to carry them through. Plans regarding the physical environment should not be cast in stone but should be a flexible incomplete urban framework that is able to adapt to unforeseen changes and accept new conceptual ideas in the contingent urban environment. Also, in the race to beat the 2013 deadline, the frenzy of calling for volunteers to document the graves has conveniently blanketed the fact that this decision was thrust upon us. Open active public discourse would facilitate a transparent participatory process that will build trust in governance. The recent proposal to digitise the cemetery involves a dystopian concept where real urban experiences are simulated in hyper-reality. This future where history and urban space is a matter of a click of the mouse is a horrific thought. We really are in trouble if this becomes the preferred solution to our urban contestations. We support the letter to Today by Mr Liew Kai Khiun, ‘Golf courses, not history, should make way’. A golf course is about 80-100 hectares, easily the size of a BBC (86 hectares) or Singapore Botanic Gardens (74 hectares). It is a spatial injustice when so many golf courses take up a large amount of land while servicing only the privileged few. In contrast, the government’s ready engagement of the public regarding the fate of the KTM railway land should be applauded. The various design schemes and ideas proffered in the consultative process provide a clear directive towards any potential development, that is, to keep the 26km tract as a public green to be defended from acquisition for commercial use. The Rail Corridor is an unprecedented historical opportunity to provide wonderful experiences to all income and age groups, whether as a leisure and recreation site or a venue for art and cultural activities. A vibrant people-oriented corridor will generate a strong and unique image of our physical identity. It can become an iconic place with a long and complex history that all Singaporeans can be proud of. ‘Land scarcity’ and ‘transport needs’ are often used as the rationale for development. We require more imaginative solutions to these needs, for the day will arrive when we will have finally run out of land. We need to stabilise our population between 5 and 5.5 million, minimise our carbon footprint and work towards achieving environmentally sustainable lifestyles. It is critical that we change this singular mindset of “destroy-and-rebuild” that the nation has perfected into a treacherous art form. How many roads do we need to achieve maximum flow of vehicular traffic? Infinite! New and/or bigger roads would only induce demand for more roads, a common illusion with automobile-oriented cities. In an age concerned with the carbon footprint, this car obsession is a great obstacle to achieving a sustainable city. Public transport remains the most effective, affordable and reliable way to move people for long distances. Cycling and walking are important complementary alternatives that are seriously under-explored here. There must be a “reset” in urban design towards a people-oriented integrated transportation network capable of meeting the needs of the majority of citizens. The Save Old School (SOS) campaign began as an effort to save an alma mater but really concerns the land use and development of the Mount Sophia site, an area that is in the process of being transformed into a high-end residential district. This is yet another contestation that foreshadows the insidious losing of our Commons. It is not about deciding which buildings are more deserving of conservation but whether any building should be torn down for redevelopment at all, versus say refurbishment and retrofitting. For BBC, it is not how the graves should be researched or archived, but whether the site should be preserved and improved as a memorable public space. 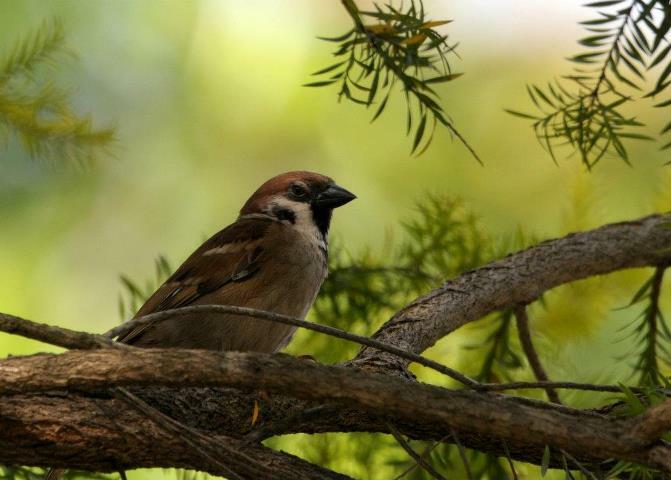 These urban contestations form part of the fight to protect the Commons. One should not mistake these efforts as reserved only for sentimental conservation buffs and idealistic dreamers; they are matters that concern us all. WILLIAM S.W. LIM is an independent writer and urban theorist. FAITH WONG majors in architecture, and is currently Lim’s researcher. The community of concerned groups over the future of Bukit Brown is formally calling for a moratorium on all plans for Bukit Brown. This moratorium should be in place until there is clarity over long-term plans for the area and discussions over alternatives have been exhausted. Given on-going national discussions over housing, transportation and immigration, there is room for policy adjustments. Plans to develop housing and transport infrastructure in the greater Bukit Brown area cannot be made when these discussions are underway and before the public has had an opportunity to fully consider the details surrounding such proposals. In addition, there has not been sufficient time for a public conversation over plans by the Urban Redevelopment Authority and Land Transport Authority for Bukit Brown, nor a discussion about the alternatives proposed by the Nature Society’s position paper issued in December. We are asking for more meaningful engagement than what we have experienced so far. Bukit Brown is important enough that all parties should be able to participate in discussions over its future reasonably as interested citizens, whether individually, as informal communities, or organised formally. We enclose here a longer statement issued by the community to the Ministry of National Development after the end of a closed-door meeting today. We affirm that the level of engagement is wanting and insufficient consideration given to possible alternatives. We remain unconvinced that the ministry’s approach is the only viable plan for Bukit Brown. We continue to seek fuller engagement over plans for Bukit Brown, and will explore other avenues to voice our concerns, including with the Prime Minister and the Minister for National Development. Cutting down trees are not planning for the future! Clip shared to remind our ugly side?